Synopsis: Big city lawyer Hank Palmer returns to his childhood home where his father, the town’s judge, is suspected of murder. Hank sets out to discover the truth and, along the way, reconnects with his estranged family. 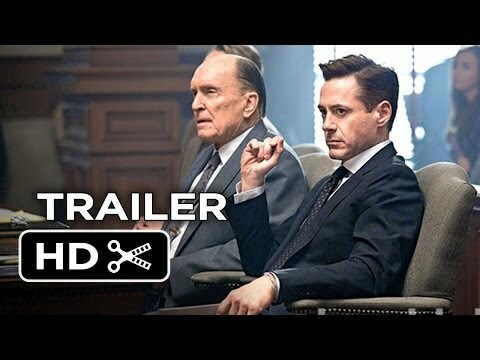 Hank Palmer (Robert Downey Jr) is a slick, cocky and arrogant defence lawyer who has successfully overcome whatever scruples he might possess to carve out a highly lucrative career as a defence lawyer for the prosperous guilty. As he explains to a prosecution lawyer whom he is in the process of defeating (and has literally pissed on in the gents) “innocent people can’t afford me.” It’s fair to say that in many movies, Palmer would be the villain of the piece, but in David Dobkin’s The Judge he’s a man on a voyage of discovery. Returning to his home town for the funeral of his mother, Palmer is reunited with his father, Judge Joseph Palmer (Robert Duvall – The Godfather, Jack Reacher), with whom he shares a prickly relationship, and his two brothers, Glen (Vincent D’Onofrio – Full Metal Jacket, Escape Plan), whose promising baseball career was terminated before it even started when he injured his hand in a car crash, and the mentally handicapped Dale (Jeremy Strong – Robot & Frank). Palmer and his father barely share two sentences during the son’s visit, and Hank is gratefully seated on a plane home when he receives a panicked call from Glen to tell him that their father has been arrested on suspicion of murder. A man who murdered his ex-girlfriend while serving an over-lenient community sentence imposed by Judge Palmer in defiance of the jury’s decision, has been run down, and the judge’s car has incriminating dents on its front bumper. Although Hank is a highly skilled defence lawyer, his father employs the under-experienced C. P. Kennedy (Dax Shepard – This Is Where I Leave You) who it appears will be no match for prosecuting attorney Dwight Dickham (Billy Bob Thornton – The Alamo, Bad News Bears). 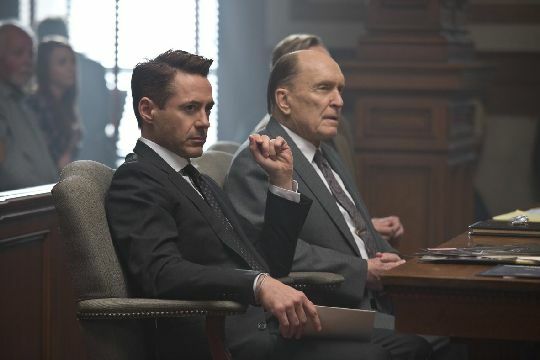 More of a character study than a courtroom drama, The Judge is a powerful, intelligent examination of an apparently irredeemable father-son relationship which manages to rise above some formulaic elements thanks to superlative performances from Roberts Downey Jr and Duvall. At 83, Duvall still possesses the acting acumen to hold his own with his younger co-star, and their confrontational scenes together crackle with tension. D’Onofrio, one of Hollywood’s most under-rated actors, also excels in a role which offers less opportunity to emote. What chances he does get he grasps with relish, however, and it’s a shame he doesn’t receive more screen time. While Downey’s cocky screen persona might be becoming a little over-familiar these days, the slow transformation of his character as he comes to understand the reasons behind his father’s harsh and apparently uncaring treatment of him, is handled with sensitivity and tact, and culminates in a pleasingly understated but emotional ending which sidesteps the sentimental pitfalls inherent in this kind of story. Highly recommended.